It’s a three-and-a-half hour flight to Istanbul cruising over Bulgaria and excellent mountain views. Somewhat delayed but landing smoothly and seemingly surrounded by water. 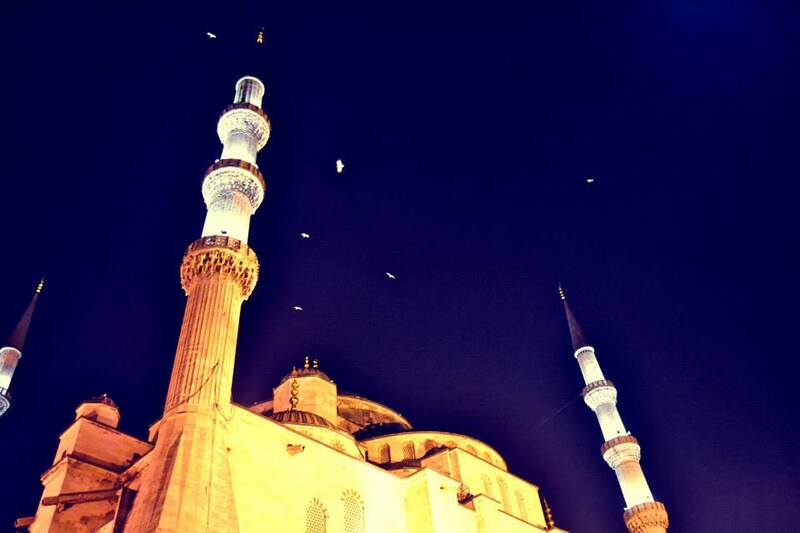 Thirty minutes in a cab around the sweeping Kennedy Cad and we are in Sultanahmet, home of the famous blue mosque. We are staying at the Hotel Sarnic, up a cobbled street on Kucak Ayasofya. We crawl up the steps to get in because the pavement is being re-built. The hotel is tired but functional and generally noisy. After gin and tonic in the hotel bar where the lighting is ferocious, we have dinner in the Mozaik restaurant of the Eresin Crown Hotel in the same street. It is pleasant enough, particularly the Turkish Sauvignon Blanc, and afterwards we step round the corner to crane our necks up at the underlit Blue Mosque at night. Seagulls wheel overhead in an eerie flock. The six minarets look majestic from down here and there is no one else around. Interruptions during the night are frequent, ranging from guests taking showers and clattering around, laughter in the courtyard below, seagulls screeching periodically, and the inevitable 4am call to prayers from the mosque. Next day we visit the huge mosque with its ornate blue tiled interior, moving on to the older Haghia Sophia opposite, where successive religious buildings have been built on top of each other for 1400 years. Restoring it is proving to be a challenge. 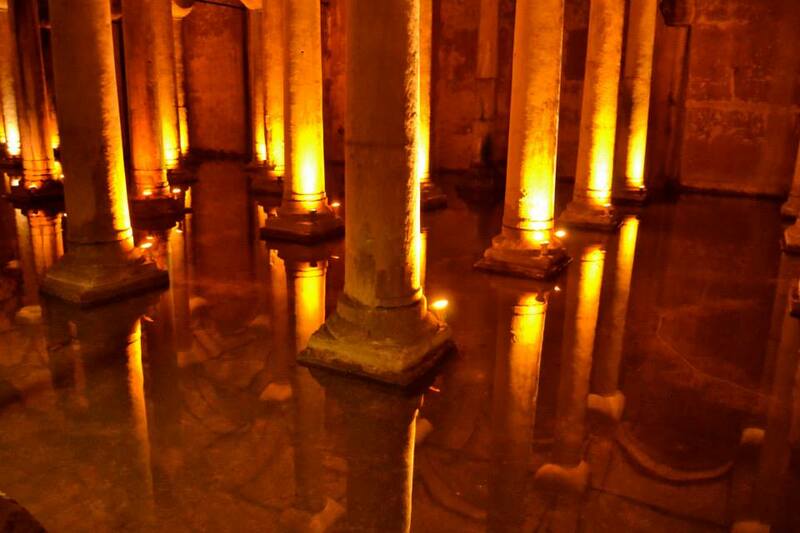 The Basilica Cistern nearby is fascinating – an underground water system built in 532 to bring water in from the woods 16km to the west – a true feat of Roman engineering. It was rediscovered later and restored in 1985. 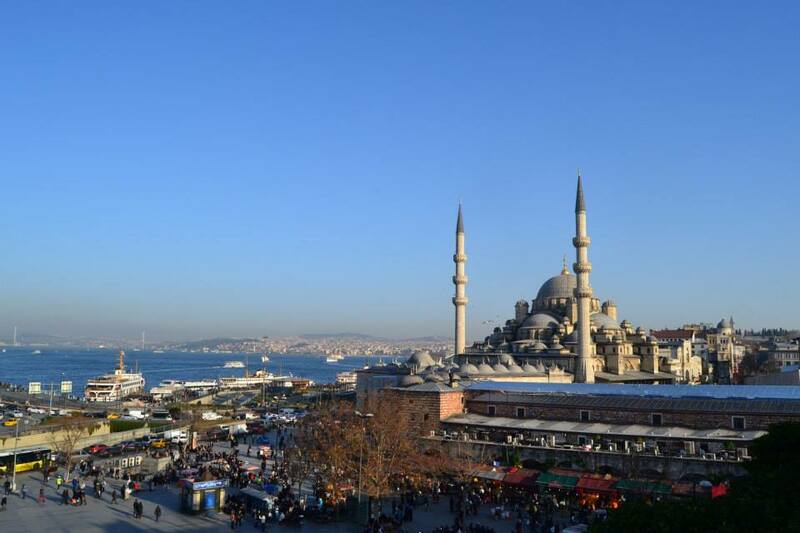 We strike lucky with lunch on the balcony at Matbah in the Ottoman palace Hotel, followed by a stroll to the Grand Bazaar, a vast market with everything you could imagine. Through some very windy cobbled streets we eventually locate the Suleymaniye Mosque, majestically perched high on a hill by the university, and offering commanding views over the Bosphoros. Down to the right the New Mosque dominates the Eminonu skyline, and the Galata Bridge draws the eye to the Galata tower. 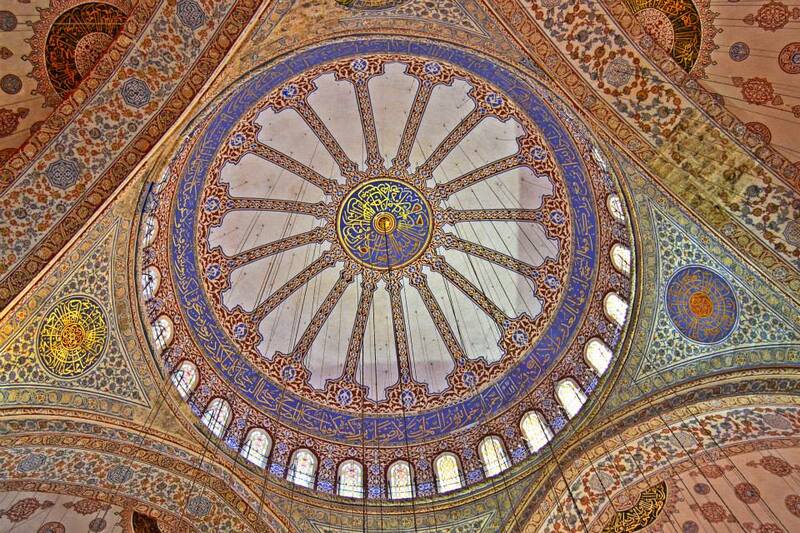 This mosque is in better condition and more peaceful than the more famous blue. We take a taxi home, which is a much more circuitous affair than walking. In fact, it turns out that the traffic system in Istanbul doesn’t really work. With a fast-growing population of around 17m, there is simply too much for the tight, small streets to cope with, and the Kennedy ring road is almost permanently choked. This is confirmed when we take a cab from the hotel in Sultanahmet to Beyoglu in the north side of the Golden Horn. It was locked solid anti-clockwise so we had to go the other way via Ataturk Bridge. The meal was superb – at Sofyali 9 on Sofyali Sokak. We were presented with a full mezze platter and wolfed it down in atmospheric rustic surroundings. The day after is Christmas Day and again it is bright blue skies. 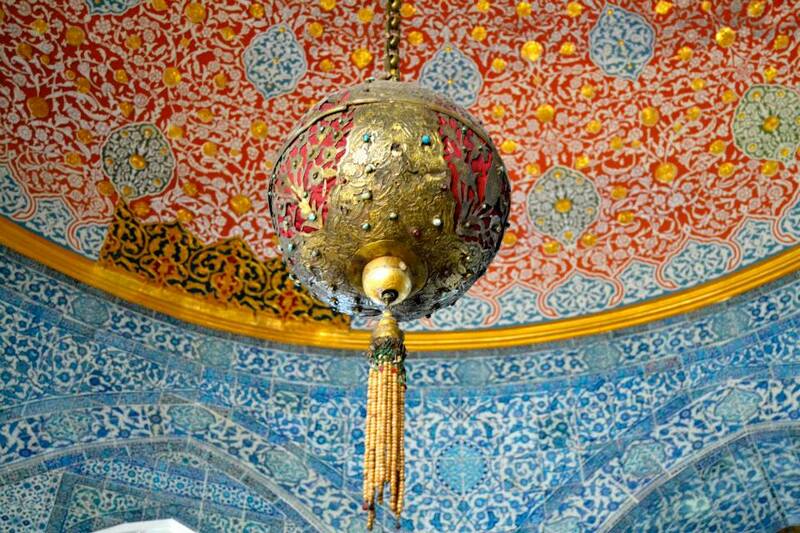 We walk up to Topkapi Palace – a massive, beautifully preserved Sultan’s residence full of courtyards and tree-lined paths. Most of the interiors are ornately decorated, and there are brilliant views in all directions over the Bosphorus and the Golden Horn. Lunch outside at the excellent Konyali restaurant allows us to luxuriate in the crisp sunshine, but beware – they don’t serve alcohol. A post-prandial stroll takes us down to the bustling spice bazaar, followed by the tram home. Having not had a blowout Christmas lunch, we opt for dinner as well, taking a charming walk through the ultra-old town, under the railway bridge on cobbled streets, to the Armada Hotel on Ahir Kaspi Sok, the outer most road before the ubiquitous Kennedy Cadesi ring road. 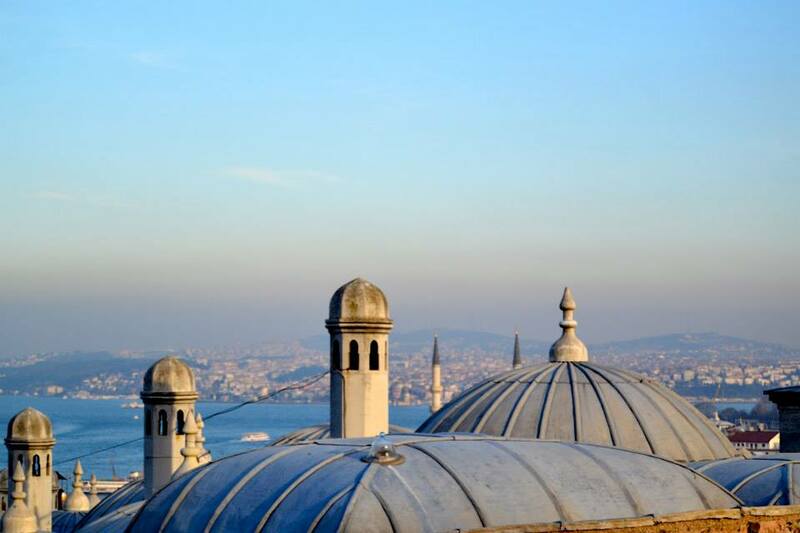 The top floor restaurant has a curious entrance taking you up corridors and past a series of rooms, but the view is spectacular, with the Blue Mosque looking inland and the Sea of Marmara on the other side. The service is slow but the food and wine are excellent – we are becoming quite fond of the Turkish Sauvignon Blanc. The next day we opt for a two-and-a-half hour boat trip on the Bosphorus. Starting at Kasimpasa on the northern shore of the Golden Horn, we travel out under the two bridges and are treated to classic Istanbul skyline with minarets aplenty. Heading north on the European side, the Dolmabahce Palace is a pile of 19th century opulence. We go under the huge modern suspension bridge that joins the two continents, up past Galatasaray, and step off briefly at the Fortress of Europe, built in 1452 at the narrowest party of the channel. It’s an ideal spot to hurl stuff at invaders. The return leg down the Asian side reveals Kucuksu Palace, an ornate hunting lodge again designed by the Armenian court architect Nikogos Balyan. Monied waterfront piles adorn the banks all the way down. Docking once more opposite the spice bazaar, we find the rather brilliant Hamdi restaurant on Kalcin Sokak, where the top floor offers even more outstanding panoramic views on a beautiful sunny day, washed down with a pint of Efes lager and delicious pistachio-infused kebabs. It’s time to go. 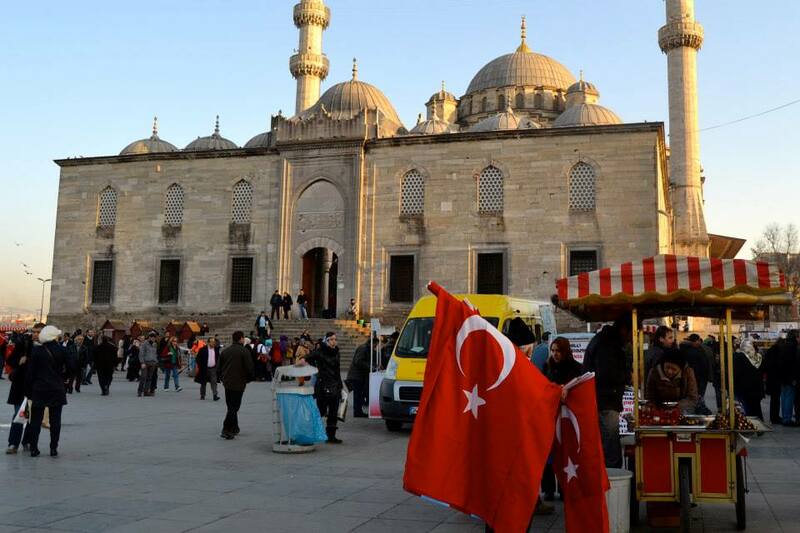 Thoughts to sum up… Istanbul is a hustle-bustle kind of place – a bewildering car crash of Asian and European, with some estimating the population now as over 23 million. A lot of the infrastructure doesn’t work, and it is overcrowded, so visitors need to be braced for a Mumbai-style assault. No quarter is given on the streets and in the bazaars. The architecture is magnificent, dominated by their unique mosques. The food is great, as is, in the main, the service. Prices cover a wide span, but in the main work out to be very reasonable. Istanbul should definitely be seen.